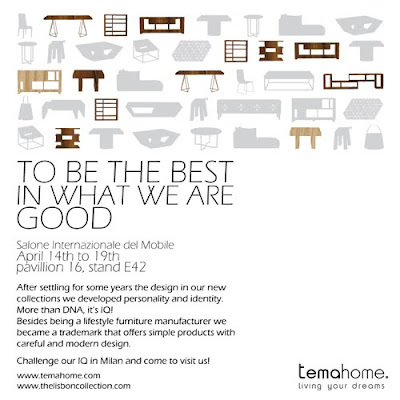 April is fast approaching and the and so the Salone in Milan. After settling for some years the design in our new collections we developed personality and identity. Besides being a lifestyle furniture manufacturer we became a trademark that offers simple products with careful and modern design. Once more we will present a collection that offers unique details that range from premium wooden finishes to colourful fabrics applied to simple but very special pieces. Modern, fashion and stylish are some of the adjectives we can use to classify our new selection of products. We will also be, again, as a part of the Portugal Brands exhibition. Created in July 2008, the Portugal Brands initiative aims represent Portugal, as the country opens up to world design influences. The mission is to be recognized as a reference in the promotion of Portugal´s most notorious brands in our industry. That alone is another proof of our commitment to be always forward thinking. Challenge your IQ in Milan and come to meet us there!